This tapestry is an 18th century copy of a 17th century original, completed in the workshop of Gobelins after a design by the artist Charles Le Brun. This tapestry was one of fourteen completed by these artists depicting the acts of King Louis XIV of France, otherwise known as the sun king. 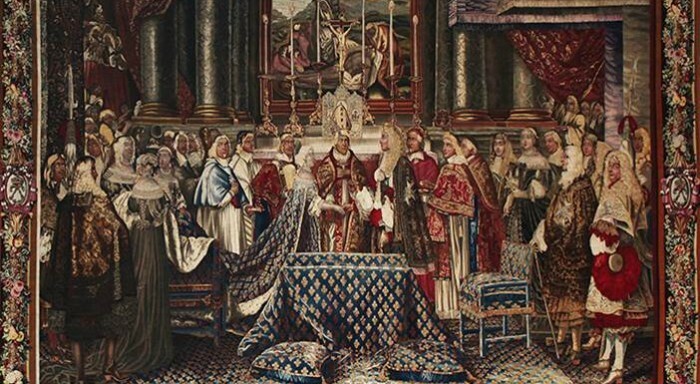 As part of a program undertaken by the Petite Academie to redecorate the royal residences, King Louis XIV commissioned Charles Le Brun to depict some of his most illustrious accomplishments. This reliance on art to broadcast the greatness of the king had long been a tradition in France, but the Sun King took it to a new level with his construction of the great palace of Versailles. Le Brun’s original designs were grand images of the King accompanied by the Olympian gods. These designs were refused by the King in favor of more realistic depictions of his civil and military accomplishments. The King was particularly fond of images depicting his role in the War of Spanish Succession, in which his marriage to the Spanish Hapsburg princess Maria Theresa played a crucial role. King Louis XIV married his double first cousin, Princess Maria Theresa Hapsburg, in November of 1658 in an attempt to secure peace between France and Spain, who had long been at war. Louis marriage to a Hapsburg princess was a personal as well as military victory, as it secured him a reasonable claim to the Spanish throne during the War of Spanish Succession. The pair had six children, of which only one survived to adulthood: Louis, the Gran Dauphin. This tapestry was on display in the Basilica of St. John Lateran. This tapestry is being restored in honor of Cardinal Cupich. Once restoration is completed, the Patrons are working with the Vatican to bring the tapestry to Chicago for exhibition. The developmental goal for the restoration is $266,000.00. Donations and commitments to date = $173,355. The tapestry is in a fair state of conservation. However, after being hung in the Patriarchio in St. John Lateran for decades, the fibers are very weak and missing in various areas. In addition, almost all the gaps typical of tapestry weaving became fragmented, creating further serious damage to the tapestry.